Jennifer knew from a early age that she wanted to help animals. At the age of 15 she started veterinary nursing and became a qualified veterinary nurse a few years later. These skills were to be put to good use when on holiday in Crete she visited an animal shelter and realised she couldn’t leave animals that needed the care and attention she could give them. She stayed and managed the shelter for 6 months in between exams. Rescuing and caring for animals in Crete remained a passion. After gaining her veterinary nursing qualifications she continued in animal welfare, using all her holiday time visiting the island and assisting with neutering programmes and helping strays in any way she could. In 2014 Jennifer and a friend, who shared her passion for animal welfare, visited Romania rescuing their first 28 dogs who they pulled from an horrific existence and re-homed them in the UK. Since 2014 Jennifer has worked full time rescuing animals. Whilst on a rescue mission to Crete she met her husband to be and moved to Crete where she lived for 3 years, seeing first hand the struggles of animals on the island. Time in Crete was spent rescuing many many animals, fostering over 180 dogs, managing neuter clinics, catch and release programmes and organising the logistics involved allowing animals to leave the island and find new families in the UK. Jennifer returned to the UK in 2017 . The charity, Chimney Farm International Dog Rescue, continues to go from strength to strength becoming a registered charity in March 2018. Tracey has been an animal lover from very early on and was lucky to have her parents support when she brought home all sorts of animals that she had found or been told about that needed help. Rescued mice, birds, rabbits, cats, dogs and even a sheep became part of the family. Growing up in a house with mainly rescue german shepherds and any other dogs / animals that chose to stay, her love and understanding of rescue was instilled from a very early age. Tracey came to Chimney Farm in December 2015. She started off volunteering in our kennels a couple times a week but, was soon there most days helping and organising the day to day things that make things run better and give the dogs in our care everything they needed. In July 2016 she accepted our first Kennel Manager role overseeing all kennel duties, treating all our dogs as if they were her own and helping with the farm animals which also lived on the farm. She continued to do this until we had to move out of our kennels in March 2018. 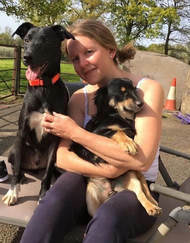 Tracey has evolved with the changes that have come since we moved to a foster model, getting involved with rescue projects, rehoming, fostering, adoptions and anything else that is needed to ensure the continued success of Chimney Farm.